We drove all day. 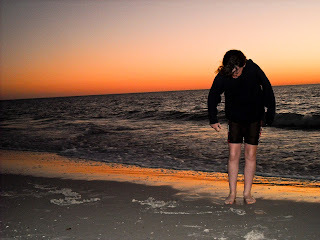 At the hotel, we quickly changed and the girls and I got back into the car, racing the sun to the nearest beach. 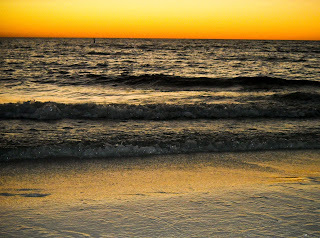 Like time and tide, sunset waits for no man and especially not "Battery Exhausted" messages on your camera. A quick dash back to the car for my extra batteries and back to join the girls at the water's edge for the last few rays of sun. In typical fashion, the reactions of my girls were very different. 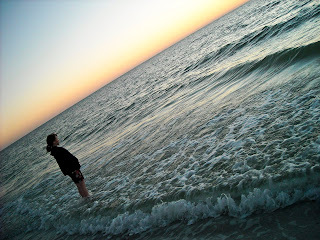 K stood quietly as the water rolled over her feet, staring out to the horizon. 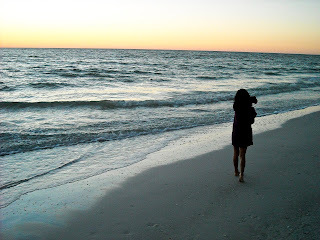 She was mesmerized by the vast stretch of ocean before her - the power and majesty, the steadfast pull of the waves. She was still for a long time simply absorbing this mighty, ancient, and living proof of God's sovereignty. My fairy child, L, flew into the water with abandon, joining the waves in their wild and glorious dance on the sand. 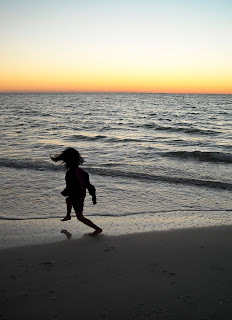 She twirled and laughed, jumped and splashed, racing through the foam in joy. Her heart sang and everything in her had to move and sing with it. 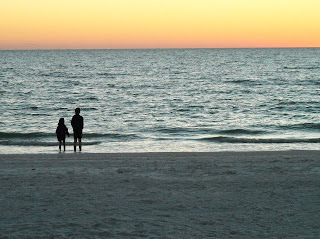 Both my daughters saw the same ocean. Their feet moved through the same waters. Yet when they looked out across the dark rolling waves, each saw a different picture. Contemplative by nature and exhausted from a grueling weekend of softball, K saw strength and peace. The sunshiny L, who had been cooped up in a car all day, saw joy and hope. So many things in life work the same way. The way we view a situation is colored by our attitude, our nature, and our circumstances. What I see is what I need in that moment and it will not be exactly the same as what you see. It's also how we see God. He reveals to us different aspects of Himself exactly when we need it. Sometimes I need his unlimited reserves of strength and sometimes I need to experience a pure and simple joy in Him. When you look at the ocean, what do you see? This post is part of Tuesday's Unwrapped. Click the link for other inspiring posts.